Moto-Mower Sports Rider 26 any info out there? I picked up this cool looking little rider last month. I looks like a cross between a Go Cart and a mower. I has a recoil start Techumseh. The tag reads Moto-Mower Model 305 , Type 100 , Serial T10223. Anyone have any info on ths model? Or pictures of another one. I think it is missing some side panels. It appears that the previous owner added the wood blocks on the foot rests for a smaller "rider"
That is awesome. Great looking pictures as well. A bit dusty, but in otherwise terrific shape. I've seen pictures of some small moto-mower riders, but they have a single roller on the back. Wonder if there are markings on the motor that might help determine the year. Looks like it might be original. Thats a great looking tractor should be nice cleaned up!! Well as much as I hate to I need to find this little jewel a new home. I just don't have the time or space to keep it. The steering is frozen and the engine is stuck. I think the steering would free up easy I just don't have time to mess with it. $60 picked up at my location. The tank, seat and engine tins are worth that. Price is Firm, I need to get my money back out of it. May be able to take it to the Portland, IN spring swap, not sure yet what day I'm going or if I'll have room. Subject: Re: Moto-Mower Sports Rider 26 any info out there? 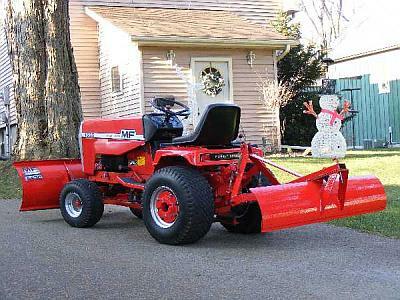 » What is your tractor/mower nickname? » How can I put a push mower motor on a Craftsman Riding Mower?